If your swimming pool's pump has recently reached the end of its usable life, you may be researching your replacement options well in advance of next year's swimming season. However, the number of pump types (and the variety of brands and styles) available can make it difficult to know which pump is perfect for your pool. Read on to learn more about the advantages of a variable speed pool pump so you can ensure you make the right choice. 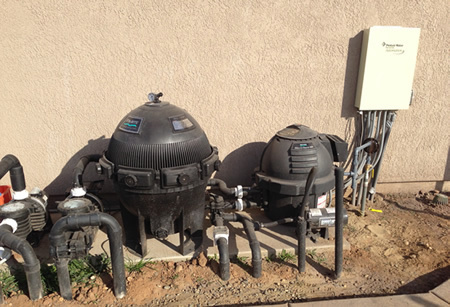 How is a variable speed pool pump different from other types of pumps? As the name implies, these pumps operate at a wide variety of speeds -- providing your pool with a trickle or a jet stream of water, depending upon its current volume and any activities you have planned. These are the most versatile of the three primary varieties of pool pumps (single speed, dual speed, and variable speed) and generally carry the highest up-front costs as compared to single or dual speed pumps. However, variable speed pumps are the most energy-efficient of all three types and can be the cheapest over time, particularly in regions with high electricity rates. If you install a variable speed pump in your pool, you'll often have an easier time maintaining water volume, even if your pool is frequently used. You won't need to worry about your ability to keep up with demand when hosting a pool party or dealing with a drought that has your pool evaporating by the second. These pumps are also perfect for infinity pools or those that require a finely-tuned pump to maintain water flow and avoid putting any extra strain on other pool components. Another advantage of variable speed pumps is their quiet operation. Even if you're not sure you'll really notice or care how loud your pool's pump is, you may find that a loud or rattling pump destroys any ambiance you're trying to create while hanging out poolside, and a single or dual speed pump may cycle on and off frequently in an attempt to maintain constant pool volume. Which pools are best suited to a variable speed pump? Although these pumps hold a number of advantages over a dual speed or single speed pump, they're not the ideal choice for every pool (or budget). Smaller pools or those that are infrequently used may derive more benefit from an inexpensive single or dual speed pump, as it's unlikely you'll be able to take advantage of all the available options on a variable speed pump if you don't use your pool very often.